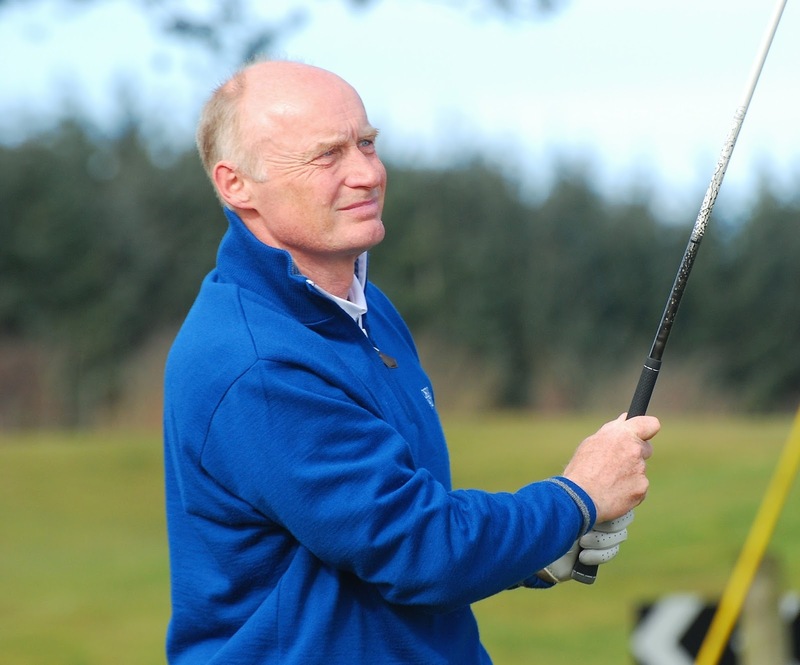 Golfing life as a winning competitor has begun again for Caledonian Golf Club's Stewart Finnie after his 50th birthday. Winner of the Aberdeen Links championship in 1994, Stewart won the senior version of this title earlier this year and today (Wednesday) he headed the biggest field of the North-east Golfers Alliance season - 105 - with a two-under-par round of 69 at Peterculter Golf Club. "I played great," said Finnie, pictured above, who birdied the sixth, 10th, 11th and 12th in halves of 36 (par) and 33 (two under). He had bogeys at the fourth and 15th. Finnie earned a voucher for £160. Runner-up with a 70 was Paul Lawrie (Gleneagles Hotel), the only other player to break the par of 71, despite a double bogey 6 when he lost a ball at the 16th. Birdies at the 17th and 18th, following earlier gains at the second, seventh and 12th, repaired the damage. "I hit 17 greens in regulation but I did not putt well on greens that were very good," said Paul who earned £130. Joint third on 71 were pros Sam Kiloh (Paul Lawrie Golf Centre), John Duff (Newmachar) and Murray Patterson (Cruden Bay) as well as amateurs Brian Nicolson (Hazlehead) and Gordon Munro (Newmachar). Nicolson did not appear on the scratch prizelist, organiser Michael MacDougall working out that the Hazlehead amateur would win a higher value voucher (£60) in the Class 1 prizelist instead of a £50 voucher in a five-way tie for third place in the scratch list. Colin Duffus (Royal Aberdeen) won the Class 1 handicap section with a net 67 off seven while Mike Rogers (Kemnay) won Class 2 with a net 69 off 18. Next week's fixture at Oldmeldrum will be the first after the clock goes back and the winter format of players going out in fours will come into operation. The last tee time will be noon. 77 D Leslie (Bon Accord), B Henderson (Deeside), J Pirie (Hazlehead). 80 A Smith (Turriff), M Herbertson (Newmachar), R Reid (Tarland), G Burnett (Westhill), D Nelson (Aboyne), D Lane (Deeside), J Scott (Peterculter), I Still (Craibstone), J Borthwick (Craibstone). 83 J Sunley (Newmachar), S Mackie (Kemnay), D McLean (Kemnay), J Kennedy (Peterculter). 84 C Craig (Kintore), J Barclay (Hazlehead), R Sinclair (Kintore), J Stewart (Banchory), M Lawrie (Kemnay). 87 M MacKay (Kemnay), M Rogers (Kemnay). 91 T Boyle (Portlethen), S Ross (Hazlehead), S Christie (Aboyne), N Chisholm (Kemnay). 92 R Brown (Kemnay), R Wright (Northern). SCRATCH - 69 S Finnie £160. 70 P Lawrie £130. 71 S Kiloh, J Duff, G Munro, M Patterson £60 each. Class 1 - 67 C Duffus £80. 69 B Ritchie bih £70, B Nicolson £60. 70 A Ramage, J Emslie £50 each. Class 2 - 69 M Rogers £80. 70 D Lane bih £70, L Fowler £60. 71 J Scott £50. 73 M MacKay £40. Birdies: 6th, 10th, 11th, 12th. Birdies: 2nd, 5th, 16th, 17th. Bogeys: 4th, 13th, 14th, 18th. Birdies: 5th, 6th, 8th, 12th. Birdies: 11th, 16th, 17th, 18th. Bogeys: 3rd, 4th 6th, 12th, 15th.